B&Z Electric Car Company was founded in 1961 in Long Beach, California and made a number of electric vehicles until the early 1980's Today, B&Z is known as the Electric Car Company and sells a range of imported electric cars. Early vehicles included the model 167 which was a 2 seater that had tiller steering, along with the Rancho, perhaps the companies best known 3-wheeler was the Electra King. In 1972 the company was then taken over by Robert E McCoy. 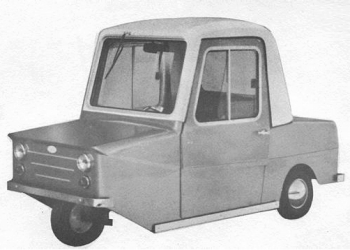 Prior to 1972 vehicles were powered by a 1 hp DC electric motor that gave a top speed of around 18 mph with a range of 45 miles. Some have been known to be powered from Army surplus tank turret motors. 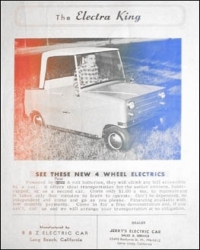 From 1972 four new motors were introduced with the most powerful giving the vehicle a top speed of 36mph. The two seater vehicle has many uses ranging from a golf buggy to trucks with a number of body designs that are mainly used at airports and factories. Both 3 and 4-wheeled versions of the Electra-King were built.